It’s been a few weeks since the world focused its attention on a few hundred acres of sculpted green grass in Augusta, Georgia. With its soaring pines, hot pink azaleas, stone bridges, and greens that look like they’ve been shaved with a straight edge razor, Augusta National hosts golf’s preeminent talent, all vying for a green jacket that anywhere else would be a questionable fashion statement. It is South Carolina, though, that is really the golf capital of the country. It has hundreds of courses and is often (if not always) voted the top golf destination. Perhaps it helps that it is the birthplace of golf in America. 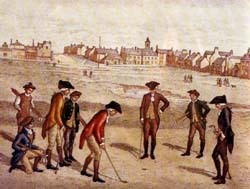 Golf in South Carolina can be documented as far back as 1743. Men of leisure, gathered at Harleston’s Green, one of the larger public greens in the town, bounded by Coming St., Beaufain St., the Ashley River, and Boundary St.(now Calhoun). These men of leisure knew how to have a good time in post-Revolutionary War Charleston. Their rice or indigo plantations were flourishing and they had time to attend dances, concerts, and the theatre. They tended to be the out-doorsy types who also loved horse racing, cricket matches, and golf. In 1743, Charleston merchant David Deas ordered a shipment of 432 golf balls and 96 golf clubs from the Port of Leith, Scotland. This seems to prove that golf was already popular in the colony, unless Deas was apt to fling his club into the water when he hit a bad shot. It was a few decades later, on September 29, 1786, that the South Carolina Golf Club was established. 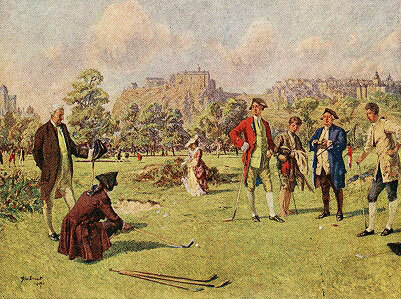 While the golf of the late eighteenth century differed from the golf of today, several traditions have endured. “Fore,” for example, comes from a finder walking ahead of the golfers on the busy public green, shouting “Be Forewarned” that bystanders may get smacked in the forehead with a ball. Those scarlet coats that golfers wore were so that they could be easily spotted and avoided. The terms green and green fees come from the sport being played on the public green. So as you enjoy this season’s golf, and the beautiful courses around the country, remember it all started in Charleston, SC.